Tea is widely used as a dye and its stains can be, well, a bugger to get out of a nice white shirt for instance. 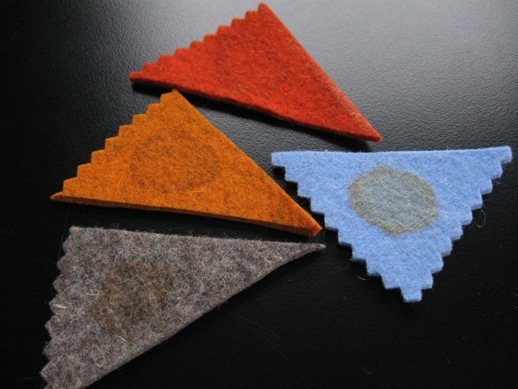 Since cleaning and care is a common question about these wool felt tea cosies I thought I’d re-post some cleaning tests I did a few years ago. In the name of science herewith a test run of tea stains on some samples of the felt used to make the flock’s tea cosies and a step by step on cleaning. The dense wool naturally resists liquid, in this case a teaspoon of fine high-grown ceylon tea. 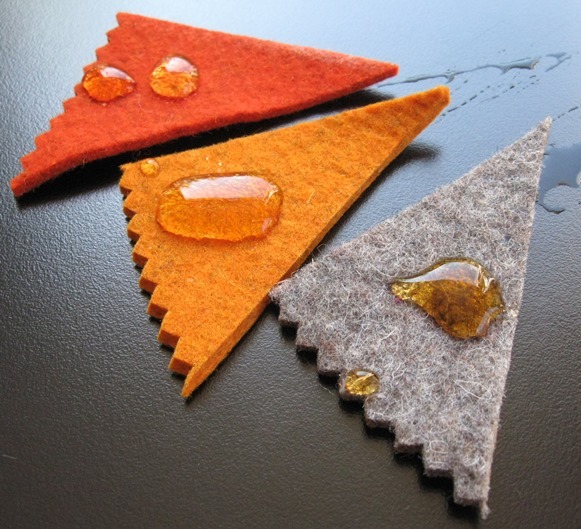 Note how the felt fabric naturally resists the liquid? Now’s the time to quickly blot it up. Use a clean white paper towel or rag and gently blot the liquid. As the stain is absorbed into the paper towel, keep moving to a clean part of the towel so you’re not re-transferring the tea into the felt. It all comes off with no staining evident. 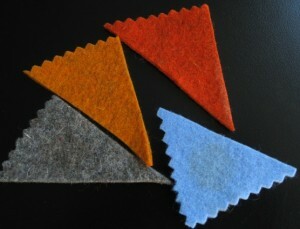 With time and movement the tea will be absorbed by the felt fabric. So in the interest of science (and with some effort) some strong black tea was rubbed in to the wool felt samples. The Cornflower Blue sample was added for this test since it’s a paler colour. 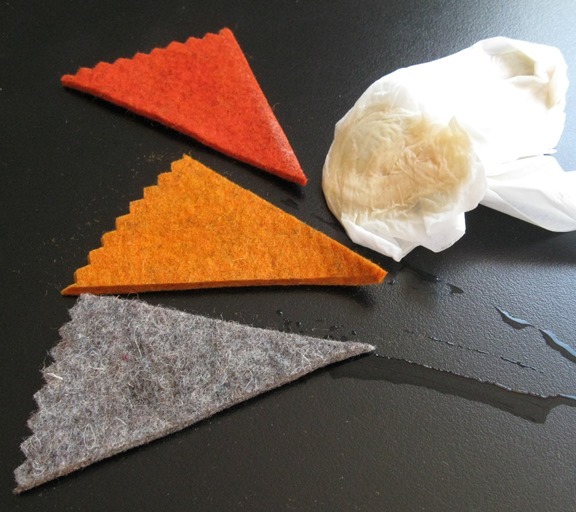 The tea spots were lifted on the Tangerine and Burnt Orange by firmly blotting with tepid water using a clean white paper towel. No soap or dish detergent was used — just water. As you can see, there are no spots visible on the Tangerine and Burnt Orange samples, but there are spots faintly visible on the Industrial felt (which is 80% wool) and the Cornflower Blue samples. So I went to work on the Industrial and the Cornflower Blue samples. The Industrial came clean with just a bit more blotting with tepid water and clean white paper towel. On the Cornflower Blue I tried i) baking powder (didn’t work), ii) salt (worked a bit) and finally iii) some hydrogen peroxide bleach. And it worked! I put about half a teaspoon on the sample and let it soak for a few minutes, then blotted it as dry as I could with clean white paper towel and let it dry on the windowsill. 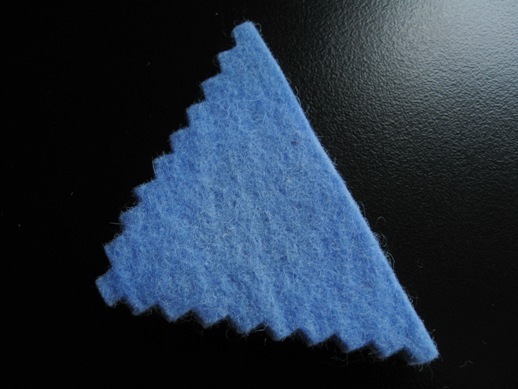 Note: I used no soap or detergent in this test, either of which would have required rinsing which means more work and more wear on the felt finish. For settled stains, gently infuse the spot with tepid water and firmly blot with a clean white rag or paper towel. As the stain is absorbed into the paper towel, keep moving to a clean part of the towel so you’re not re-transferring the tea into the felt. When clean, blot dry (press firmly) with clean dry material. This generally does the trick. For the pale cosy colours I’ve had success with short (2 minute) spot-infusions of peroxide bleach (never use regular bleach) followed by gently blotting with tepid water, and finally blotting dry.